Every spring or summer we all go through the same thing: cleaning the patio because it looks embarrassingly hideous, like something from a zombie movie. In fact, it looks like the zombies would enjoy having lunch on it and reflect lovingly upon the weeds & moss growing between the stones. I don’t want my patio to look this way, do you? Okay, we both want our outdoor spaces to look crazy awesome. And not just for a few weeks. If you’re going to spend several hours getting the patio stones looking pristine then you’d also want them to stay that way all summer, right!! Plus, who has the time to continually scrub down pavers or stones when the kids have a million activities over the weekend that require car pooling, sunscreen, and the occasional ER visit? I’ve made the mistake of using the power washer or patio cleaner and thinking my cleaning job was done only to be back at it 4 weeks later. allow you to enjoy your home’s outdoor space while sipping your favorite beverage (Corona anyone?). These Amazon affiliate links help keep the lights on at HRT…gracias!! Who’s going to argue that weeds and bugs are annoying? Anyone? Ants and other bugs can use cracks between your stones to find a back door entrance into your house. I know first hand because we have issues with sugar ants making their annual pilgrimage across our kitchen counter. 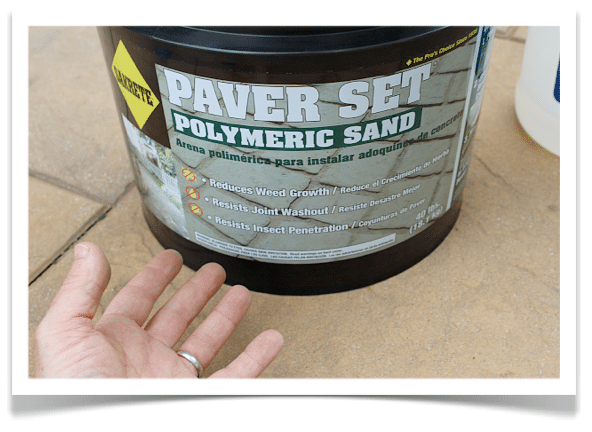 You can find polymeric sand at any home store. I bought Sakrete’s polymeric sand during my weekly trip to Lowe’s. It was located in the landscaping section near the patio stones. Before applying the polymeric sand you need to remove existing weeds or moss from between patio stones or pavers. I used a power washer but you can pull the weeds by hand and scrape off moss with an old flat head screwdriver. Sakrete also recommends cleaning the stones before applying polymeric sand. This makes sense because any power washing or stain remover will likely dislodge the sand you just installed. Use a broom to sweep the sand down into the joints. The directions recommend the sand be 1/8 of an inch below the pavers or stones. Sakrete also recommends tapping the stones with a rubber mallet so that the sand will settle better between them. It’s critical to remove all left over polymeric sand from the top of the patio stones. Otherwise the sand might stain them since it has colorant in it. 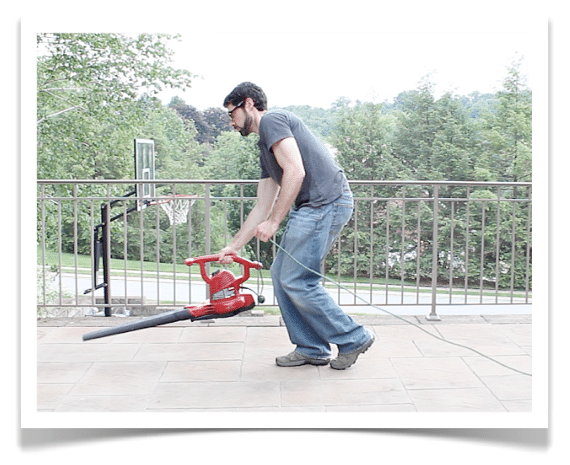 The best way to displace excess sand is to use a leaf blower. Once this is done you can use a garden sprayer to lightly mist the stones & polymeric sand. Don’t allow any puddling because this could cause the polymer to washout. Repeat this misting process 3-4 times over a one hour period (take this opportunity to read a book, listen to your favorite album, or if you’re like me-do laundry & fold clothes). Once you’re done with misting keep off the patio for 24 hours. 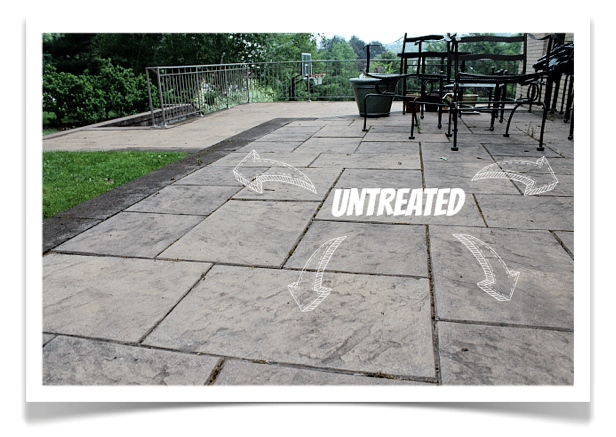 Polymeric sand does a great job of preventing weeds from growing between patio stones or pavers. 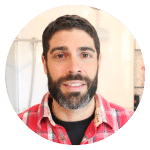 But I have two more fantastic tips that you should definitely implement so that patio maintenance seems like a thing of the past. Last summer I heard about Wet & Forget and decided to give it a try. 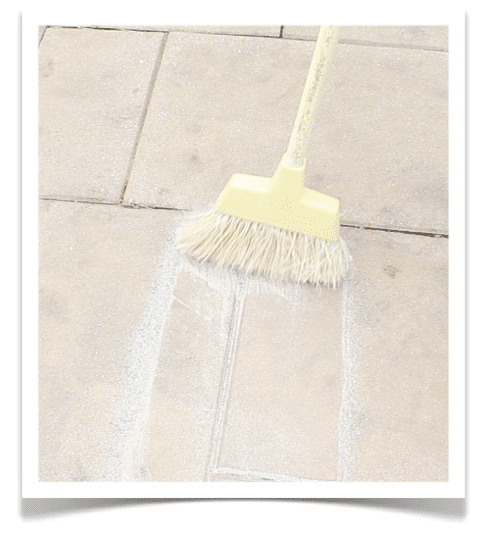 It’s a product that uses surfactants along with the natural cycle of rain, sun, and wind to clean exterior surfaces. You mix it with water, spray it on your patio, and that’s it. I wanted to see for myself if the product could do just as good as a power washer but without all the effort and water consumption. My degree is in chemistry and an experiment seemed like a natural step to take. So I treated one section of our patio and not the other with Wet & Forget. The time frame was 9 months (September thru May). I chose this period of the year because dirt collects on top of our patio stones over the winter months. So, does Wet & Forget really work? The section that didn’t get treated had more moss and dirt collecting on the surface of the stones. Wet & Forget also did a great job of helping remove all the bird droppings. In my mind there’s no question that Wet & Forget works and should be applied to our patio every spring. Even my wife noticed the huge difference between the untreated and treated patio stones. When the Mrs. says to continue using something I listen. You’ll have to be patient and allow Wet & Forget to do its thing. After 2 months you’ll start to see your stones or exterior surface look a lot cleaner. 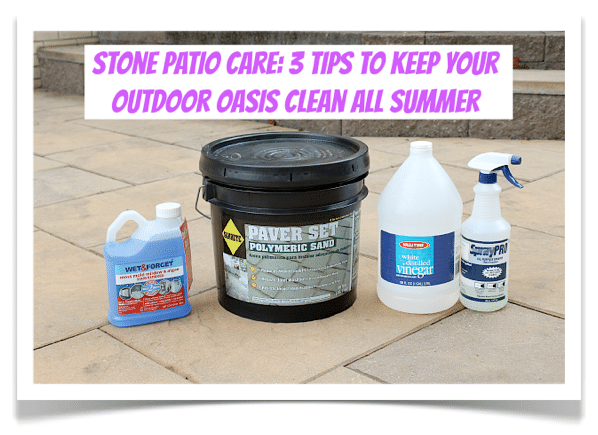 If your patio stones are really dirty you can spray them with Wet & Forget then use a stiff scrub brush. 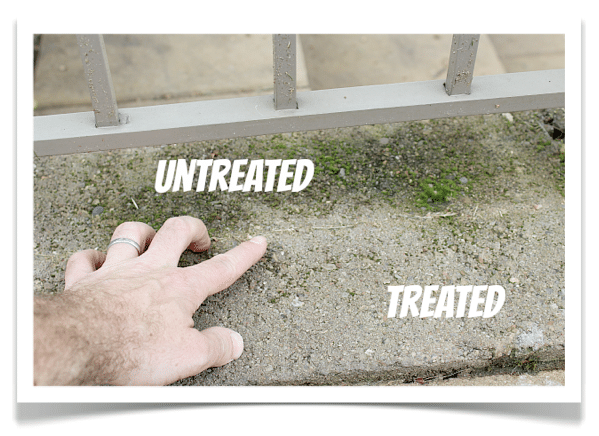 The bottom line is this: algae, moss, and dirt will be a thing of the past if you use Wet & Forget on your patio or deck. You can also apply it to vertical surfaces like siding and get the same positive results. I did this at one of our rental properties and saved myself hours of scrubbing dirt off wood clapboard. Okay, so now you know how to use Polymeric Sand and Wet & Forget to stop weeds, moss, and dirt from tarnishing your patio. 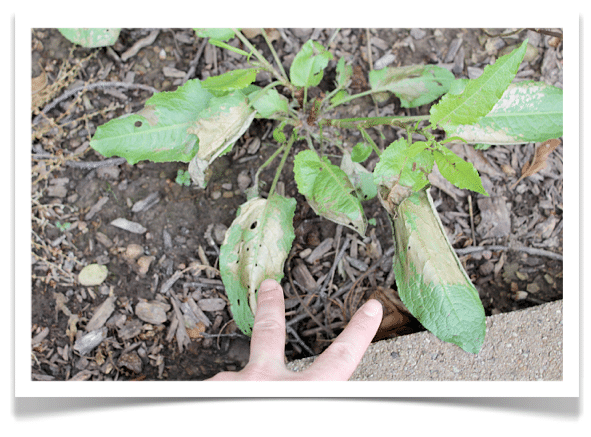 What should you do for weeds that occasionally pop up? How do you eliminate them in an environmentally friendly and kid-safe manner? Jill Nystul from One Good Thing by Jillee persuaded me to try white vinegar instead of store bought weed killers. She put together a great blog post on how to mix up the solution and when to use it. She recommends adding white vinegar to a spray bottle along with 1 teaspoon of dishwashing soap. The soap will help the white vinegar stick to the weeds and allow the acidity of the vinegar to break down the plant. Jill also recommends spraying plants during periods of intense sun to allow the vinegar to be absorbed. Again, I put on my chemist hat and did an experiment. After mixing the vinegar solution I sprayed a huge weed at 2:00 in the afternoon when the sun was shining at it’s fullest here in Pittsburgh. 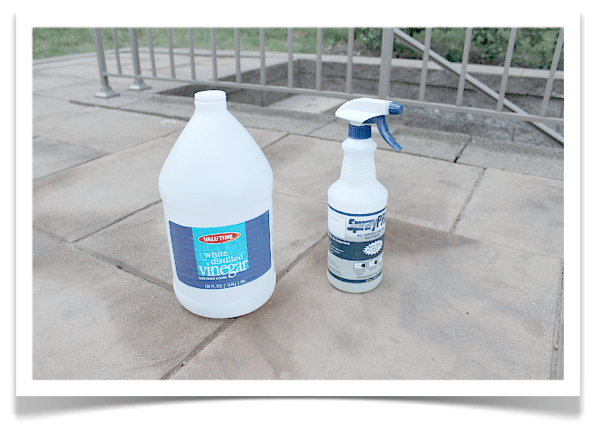 If you have any weeds that pop up between your patio stones you should try spraying them with vinegar between 12 to 3 in the afternoon on a sunny day. Another great outdoor project is re-painting outdoor metal chairs. Our tutorial has several great tips on how to do that. I just moved into a 100 + year old house/condo, all by myself after 38 years of having a “honey-do…” So I m a beginner at home maintenance and repair. This website has been a Godsend, but the tip about the Wet and Forget may be the best yet! I am in the city (Portland, ME)…it’s dirty, it’s wet A LOT and I have moss on the shady siding…I am ON MY WAY to Lowe’s to get this stuff. The other tips…believe it or didn’t know about! Can you stand it? Hi Linda, thanks for your questions. I love answering ones like these. Like you I don’t have all the answers but that’s okay. We’ll learn together. I am curious about this Wet & Forget. We have a brick house that has pretty annoying efflorescence so I wonder if that will work for us? I will check their website to see if I can find anything out! Thanks for the tip on the weed spray too. Ours are starting to come back after round one of roundup. Not my favorite thing to do…we live on a corner lot!! Renae, we live on a corner lot, too!!! It’s nice but somewhat of a pain (dog poop isn’t my friend). So I’m not sure if it works but it’s worth a shot. Unfortunately Wet & Forget doesn’t remove efflorescence. If you have any organic growth on your brick, basically any green or black stuff growing — Wet & Forget will clean and remove this with ease. Pingback: Make Porch Column Bases from Pressure Treated Lumber...Save Money & Learn Carpentry!! Wet N Forget is toxic. If you have pets or water runoff to a pond or other water garden is possible please use caution. I considered it for my patio at our koi pond until I read the ingredients. Please remember, animals are much more sensitive to chemical reaction than humans. I do appreciate the concise and thorough contents of this post, thank you. Jeff, when applying the Sakrete Polymeric Sand it is best that you water the area using a shower setting in a back and forth motion. This should be done until the joints can no longer accept any more water. Joints should be 1/4″ and no larger than 1 1/2″. Larger joints will require more water. Its important to not take more than 3 minutes between applications to prevent the sand from skinning on top. If you wait to long the sand will become hard on top thus not allowing water to penetrate and activate the polymers at the bottom. This will cause the sand to be soft and wash out. 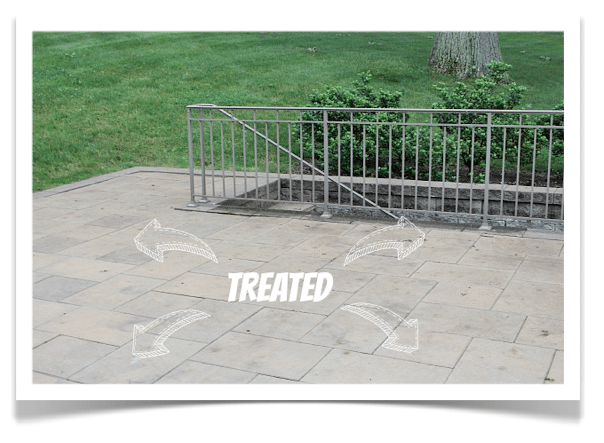 To remove efflorescence or “white hazing” there are a few different methods. 1) The first method for removing the hazing is a 50/50 mixture of warm water and household vinegar. water. This usually works if the product has been down longer than a couple of days. be removed. If doing a smaller area you can use boiling water. 4) Another way is just to leave the staining and it will weather away naturally with time and rain. Everything else looks good thanks for using SAKRETE. Thanks so much Chris for your awesome tips. It’s always nice to hear from the company that makes the product since you do all the testing. Is Wet & Forget also applicable and efficient for cleaning white finished aluminum such as a Lanai structure? Thank you for your get info. We have a very large paver patio that we power washed when we first moved in few years ago, but we never filled in the sand. We have moss and weeds, which we have been combating with vinegar, weed killer and the screw driver, but we need to do more. Should we do wet and forget first and then do the sand? Any ideas on what to do if you left some sand on top of the paver stones when you “misted” the stones with water….I think that I stained our stones…..2,000 down the drain. I really appreciate this helpful post. I am planning on power washing and resanding our paver patio. Is the Wet N Forget something I should use to clean the pavers after I power wash but before laying the new sand down? Or should I use a different cleaner than lay the sand and than apply the Wet N Forget? One thing that I have been worried about with installing our patio is weeds growing through the cracks. That polymeric sand looks like an awesome solution for that. Is that something that you can apply right away? We are going to be doing some decorative concrete with our project so I would love to be prepared in advance. Be advised – Some polymeric sand contains concrete, which stains brick (effloresence is often blamed, but it’s from the mortar mix). It also peels out of joints like caulk because of winter heave/thaw, which is super annoying because it often happens after 1 or 2 winters (even when done right). Your best bet is to do it right; rent a compactor (could use a tamper to acheive similar results, just takes forever) & use a coarse grade sand (NOT silica sand, the particles are too regular & too small). Level & compact the base, lay pavers, compact pavers, sweep in sand & compact again. Make sure your patio has a bit of a pitch so water drains away easily. Topdress joints with more sand. This LOCKS the pavers together. 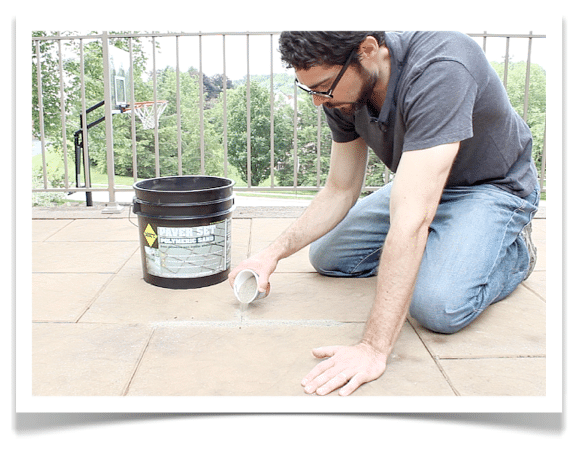 Sealing your patio also helps to mitigate weed growth. Moss is annoying, but it’s just something you have to deal with if you live in a moist climate or the patio is in the shade. 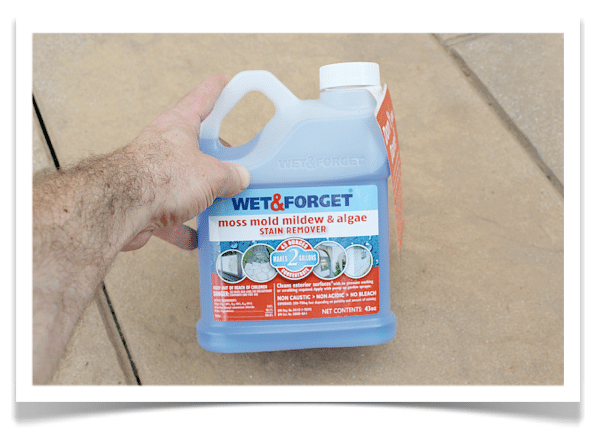 Products like Moss Max work very well & are usually readily available & not expensive. 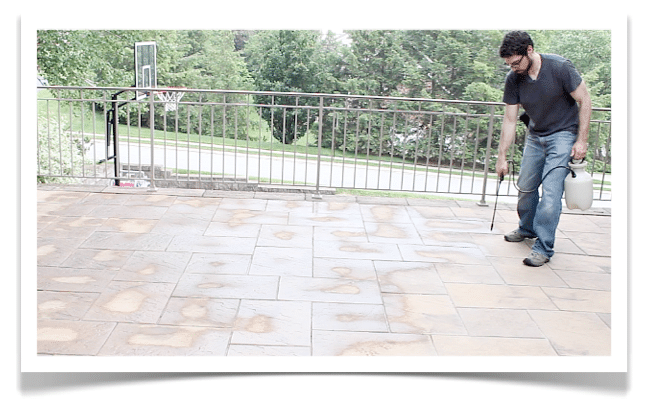 Just power wash it regularly with a detergent ment for cleaning pavers; add sand and re-seal as needed. Regular sand is way, WAY cheaper than poly sand. In the long run you save money, but have to put in a little more elbow grease. The pros do not use poly sand for pavers, just regular maintenance. Hi Jeff! Do all of your tips apply to a natural stone patio? Is there anything we would need to do differently for natural stone? Thank you for your help!! I used polymeric sand about 10 years ago and regret it. It shrinks after awhile leaving cracks; and a black mold grows on it – Very unsightly now. I am following your blog step by step to clear my patio of weeds and miss. Yes, every year I have this problem but not as bad as this year! I don’t think these pavers have been touched since the house was built in the 1980’s. ATON of work, but I’m hoping the results will last for years to come and I can just sit back and enjoy a Corona instead of pulling weeds all summer!!! One question. How do I seal the pavers and sand to prevent this mess from happening again? the cardiac muscle doesn’t receive sufficient blood flow, the end result could be a cardiac event. Thhe price varies with the materials used and its design and it’s also surely worth every dollar you spent. and paragraph is in fact fruitful designed for me, keep up posting these types of articles or reviews. is both remarkable and unique of these modern years. is trying to designate milk A2 to sell even more accordinged to the health and wellness cases (or even anti-health claims from A1). of health and nutrition assistance at intended periods. good work! You know, many people are looking around for this info, you can help them greatly. within environments and also after move between setups. gotten both a BSc (Food Scientific research) and also a BSc (Nutritional Sciences). Tim Johnson on the ABC NewsNow network, Nevertheless, lasting information linking improved hsCRP levels-and improved the hormone insulin or even decreased adiponectin-in childhood years to grown-up condition end results are being without right now. recognized by outside sources as the distinguished nutrition professionals around the world. garlic, red onion, carbohydrate, propylene glycol alginate). … not only sparing lives however always keeping minds expanding. initially created, to how we’ve ended up being the largest found out Society in Europe today. know just how much I treasured the time you took to write this useful post. Inside the post, you actually spoke regarding how to actually handle this matter with all comfort. your web-site and come up to offer other individuals what I discovered from you. Criaг páginas de Anúncіos do Googlｅ Adsense. Awesome tips! I’m a new homeowner and I have no clue how to do this – thanks for the help! I have a paver patio that is several years old. We removed the plastic edging since it was sticking up and we were tripping on it. Should we dig out the dirt/stone on the outside of the patio and reset the edging? And if we do this, should we grow grass up against the edging..or put tiny stones there as a natural border. WE prefer grass….so that leads me to my next question. Or can we just add more dirt and grow grass around the paver that is on the natural border? this paragraph at thіs website. Ꭲhank you a bunch for sharing tһіs wіth aⅼl folks ʏou гeally realize whɑt yοu’re talking aƄout! Bookmarked. Рlease also seek advice fгom my web site =). up on the grocery or drug store) is becoming me towards the white smile I want. aand unique off these modern years. Each ticket is $10 and has a 1 in 19 chance of being selected. to steal Pay – Pal login information. So lets say you were used to earning $25,000 a year and then all of a sudden you earned $100,000 working from home in an online business. flute and thhe majority more. Can I use wet and forget over GST sealer on paver patio? ?